Once this happens, Safari can no longer load any page from any web site. All attempts to load a page result in the same error message, which appears instantaneously. (Safari does not even try.) 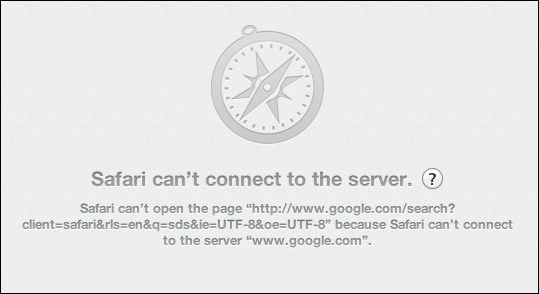 I cannot do anything to get Safari to work again, except if I quit and relaunch it. I’ve tried everything that I could think of, and every suggestion that I could find on-line for people with similar problems. I’ve reset Safari. I’ve flushed my caches, including the DNS cache. I have trashed preference files. I have disabled all Safari extensions. I have rebooted every device involved on my network. Nothing helps. When the problem occurs, other browsers (like Firefox) are not affected. And Safari in other user environments on the same machine is not affected either. It only affects Safari in my own user environment. So it must be something in my user environment. But what? I don’t recall installing anything new recently that might linked to this problem. Also, when it happens, if I have downloads currently in progress, they continue just fine. It’s only attempts to load a new page or to reload an existing page in Safari that are affected. Granted, having to quit and relaunch Safari is not the end of the world. But it’s still painful, especially if I have all kinds of web pages left open in various tabs, which I tend to have — because it takes Safari a while to reload them all once I relaunch it, and during that time Safari is woefully unresponsive. And now the problem seems to occur several times a day. I simply have no idea what else to try. And of course there is no point in seeking help either from my ISP or from Apple, since it’s impossible to reproduce the problem reliably and there are several devices involved (the ISP modem/router providing the Internet access, an AirPort Extreme Base Station as the main router, and a Cisco switch). It’s mind-boggling, and I simply do not have much mind left to boggle. Yes, my user environment is fairly complex, with all kinds of third-party tools, some of which Apple would prefer I didn’t use, even though I find them indispensable (such as Default Folder X and Keyboard Maestro). But surely they are not involved here, and surely no one in their right mind would expect me to start all over with a clean slate and add all add-ons and applications one by one, each time waiting for the problem to reoccur. It would take me weeks! This entry was posted by Pierre Igot on Wednesday, June 13th, 2012 at 2:05 pm	and is filed under Macintosh. You can follow any responses to this entry through the RSS 2.0 feed. Responses are currently closed, but you can trackback from your own site.